UN Secretary-General’s Special Representative for Afghanistan, Tadamichi Yamamoto, meeting with officials in Afghanistan's Nangarhar province. Afghans need to see their Government taking the reins for security in the country, delivering much needed services and creating jobs, says the United Nations envoy to the country, Tadamichi Yamamoto. At the same time, Mr. Yamamoto noted that that the international community needs to keep the promises made at the Brussels conference last October to support Afghanistan politically and financially on its path towards peace, development and a stable economy. 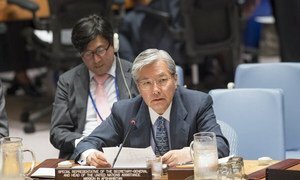 Mr. Yamamoto, the Secretary-General’s Special Representative and head of the UN Assistance Mission in Afghanistan (UNAMA), was in New York this week to brief the Security Council on the latest developments in the country. In an interview with UN News he elaborated on issues such as the parliamentary elections slated for July 2018, the security situation in the country and what a genuine peace process with the Taliban might look like. UN News: What do you see as the necessary steps to address the deteriorating security situation in Afghanistan? The people need to have confidence in the efforts of the international community and the Afghan Government. Tadamichi Yamamoto: There are two things that we have to address. One is that in Afghanistan, the security apparatus or the Government has to really try to increase the credibility of the security institutions by, first of all, trying to reform the institutions in terms of, for instance, the command structure and try to get out of corruption so that people feel more secure about, and have the trust in, the institutions. And also, particularly given the current situation, a lot more work needs to be done in terms of trying to have more intelligence networks and collaboration with the countries in the region, as well as some other countries, to try to have the necessary information available to tackle the situation. Also, the effectiveness of how they run the security machine has to be looked at very carefully. Another thing they have to do is to ensure, with regard to the recent incidents, that investigations are conducted thoroughly… and also those who were responsible for the security will need to be accountable for the situation depending on the findings. UN News: Afghan civilians continue to bear the brunt of the conflict. What more needs to be done to assist the people of Afghanistan? Tadamichi Yamamoto: The most important thing is try to, as you pointed out in your first question, to increase the confidence and the credibility of the Government in terms of ensuring security for the country. And to do that there is a need for the Afghan Government and the security institutions to try to improve itself in terms of capability and the way they do their work. But also the international community, particularly those in the neighbourhood, need to work with them to try to arrest the possible onslaught which is expected to continue by the insurgents on the Afghan society. I think that would be the first thing. And also the people need to have confidence in the efforts of the international community and the Afghan Government, which means what the Government is delivering for the people in terms of services and job creation, and what the international community is trying to do in terms of, for instance, the Brussels meeting of last year will have to bear fruit. The result and outcome must be understandable to the people. And rather than just plan for some development and the harnessing of the fruits of the commitments, promises down the road, we must focus more on what is possible in the next few months, what is achievable in the short term, so that the people of Afghanistan actually feel the benefits of the efforts of the international community and the Government. UN News: What do you think is achievable in the next few months? Tadamichi Yamamoto: First of all, I think there are more efforts which could be done in order to create more jobs, and those are things that I think, with the concentrated efforts of the Afghan Government and the cooperation of the international community, will be immediately understood by the people of Afghanistan. The other thing is for the internal security, I think the Government should come out more publicly explaining what their plans are, what the situation is, and although I have not touched upon this yet, but also try to imbue the sense of confidence, the certainty, in the political area in terms of recent elections which they have just announced. So these things which should provide a sense of stability, a sense of certainty and assuredness for the people of Afghanistan would be extremely helpful. But it has to be accompanied by actual deeds and outcomes, not just words. UN News: You mentioned that the date for the Parliamentary and district council elections has just been announced. They are set for 7 July 2018. Could you explain why that is an important step in the process? Tadamichi Yamamoto: Elections, first of all, by definition are an inclusive political process to bring all political parties into a democratic political process… If they have something to converge on and work towards, that will provide the political basis on which the political leaders both inside and outside of the Government can come together. This is one. The other thing is that the election is really necessary in order to move forward the planned political process, including the constitutional issues, which they want to address in the future. It is a requirement that the new members be elected to work on the possible revision of the Constitution. UN News: How is UNAMA supporting the elections and the political process? Tadamichi Yamamoto: This is probably the most important role that we’re playing at the moment. For instance, we reach out to all the political leaders, both inside and outside of the Government, and have a close dialogue and try to understand the requirements, what they wish to achieve. Because of the current political situation where the political opposition is very critical of the Government, and vice versa, we play a so-called good offices role, which is a UN term. In simple terms, we try to work between those people to try to make sure that their understanding of each other’s demands are well understood and could be coordinated into something more constructive… rather than to try to have these kind of differences in political positions lead to something confrontational, and this is the role that UNAMA, because of its impartial position, can play not only well but is expected by the people to play. I think we have been instrumental, for instance, just after this tragic blast of 31 May where more than 100 people were killed, and which triggered political, what shall I say, dissatisfaction, frustration coming out even into the street, we were able to talk to the political leaders, both the young generation and the established leaders, and make sure that their grievances would not turn into something more violent. Both the opposition, shall I say the people outside of the Government, and the Government afterwards expressed their appreciation for the work of UNAMA. On elections, I think we are perhaps one of the foremost institutions around the globe to help them conduct more credible elections, both technically and perhaps in a more policy-oriented manner. And I think one of the biggest tasks for UNAMA in the coming months will be to work closely with the people of Afghanistan, and also the Independent Electoral Commission, which would actually implement elections, and ensure that the process is going to be a credible process, acceptable to the people of Afghanistan. And here, I think we will put in the most effort to make sure that we can actually make a difference and will deliver something credible to the people. SRSG Yamamoto at the Kabul Process on Peace and Security Cooperation meeting held in Kabul in early June 2017. UN News: You’ve said that ‘a genuine peace process with the Taliban’ is essential and urgent. What does such a process look like? Tadamichi Yamamoto: This will require quite comprehensive efforts not just of UNAMA but of the members of the international community and the Afghan Government. We are trying to do three things. One is to try to make sure that internally the Afghan Government and the Afghan people can come together so that they have a joint position, so that the Afghan people know what they want out of a reconciliation process for peace, so that they can negotiate as one solid position with the insurgency. The second thing that we’re trying to do is ensure that the Taliban understands that the peace process is going to be meaningful to them, and they know what they can get out of the peace process, so that they can expect a constructive negotiation with the Government. The third thing is to try to create an environment for peace negotiations. Because Afghanistan is surrounded by many countries which have their own strategic interests, these interests also have to be understood to enable this type of peace talks to go ahead. So we talk to all these regional countries to ensure that they understand that peace in Afghanistan is actually going to be helping the stability and peace, even prosperity, of these countries around the region. So those three things: to internally strengthen the Afghan establishment to talk about peace, to make sure the Taliban understand the significance of the peace process, and thirdly, to ensure that the neighbouring countries particularly can support the peace process as something that enhances their own national interests. The UN envoy at the Fourth Kabul Symposium “Afghan Women; Messengers of Peace.” May 2017. UN News: Is there anything that you would like to add that we have not yet discussed? Tadamichi Yamamoto: Yes, the United Nations carries a flag, or torch, of important norms for human dignity – like human rights, rule of law, democracy. We can show them what they mean for their future life, particularly for their children. This actually encourages them to have hope for the future, to understand that the dignity of human beings, human life, is extremely important. And we can set the standard and guide both the Government and the people, and sometimes including even the insurgents, to make sure that they all understand this and respect the need to put human dignity at the core of our activities. And I think this is one of the most important aspects of our work in Afghanistan. UN News: How can the UN foster that understanding among the many different groups in Afghanistan? Tadamichi Yamamoto: Human beings have a lot in common. They all understand the meaning of human dignity. What we have to do is appeal to that understanding. For example, when we talk about the importance of women’s rights, it may sound very conceptual and abstract. But what we mean is how women live their daily lives, how they’re rewarded in their lives – people understand that. Same thing in terms of human rights – people must not feel belittled; people have to be respected in their daily activities. People do not want to be treated unfairly, and people understand that. And if the United Nations all the time tries to stand for this – fairness, better living… fair treatment – you don’t have to talk about conceptual, abstract things like human rights. You can talk about these sentiments and feelings that everybody feels. This is common to everybody. And we conceptualize them into norms. So I think that the United Nations activities, daily activities in this regard, really promote the sense among the Afghan people that the United Nations really stands for a better future and this is something which is at the core of our existence, where people feel that respect for us. And I think it’s really important that we don’t forget this when we carry out our work for peace, politics, which are more policy-oriented, but the root of our work is with the people. Warning that the recent surge of violent attacks in Afghanistan could signal a much worse and more fragile period ahead, the United Nations envoy for the country today called for urgent action to strengthen stability, including through improving the Government's credibility, and urged all parties to exercise restraint and avoid violence.